Each user must login with their assigned Customer ID and password. Remember your password is case sensitive. Hit the LOGIN button and you will be signed in with your customer id. If you have forgotten your password but know your customer id enter your customer id and click on Click here to get your password hit. This will give you the password hit you entered when you registered. 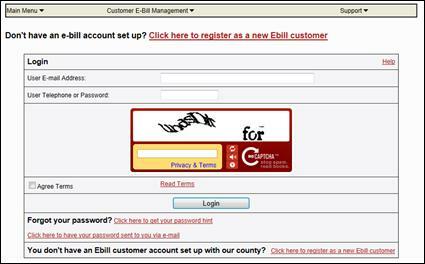 If you still do not remember your password click on Click here to have your password sent to you via e-mail. This will bring you to a screen where you may enter your customer id and your Email Address so we may Email you your password. If you do not remember your customer number go to Enter your email address for our account – enter the email address and click on Find Matching Users. If there is a user(s) for the customer id you have entered it will list the customer id(s) and you may choose it from the list. If you do not have a customer account set up with our county click at the bottom of the screen “Click here to register as a new customer”.